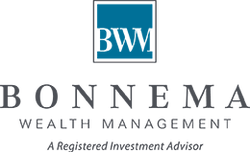 At Bonnema Wealth Management (BWM), our clients well being is are number one priority. We combine expertise in investment management and financial planning to assist clients as they seek to achieve their goals. Our assessment process is based on two premises, listening and understanding. We sit down with you and your family to understand your unique wealth management needs. BWM is a fee based only advisory firm. Rather than sell you products, we listen and learn, to determine whether or not we can be helpful. If we are not the best fit, we will tell you so. We make a promise to always do what is right for you and your family. Understanding that we are part of a larger tax, legal and estate planning framework, we work closely with our clients' trusted advisors to ensure that all facets of their lives are taken care of. We are committed to being a excellent member of your advisory team by having ongoing relationship with your tax, legal, and insurance providers.